The Motley Fool Canada » Dividend Stocks » Will Potash Corporation of Saskatchewan Inc. Raise its Dividend in 2017? 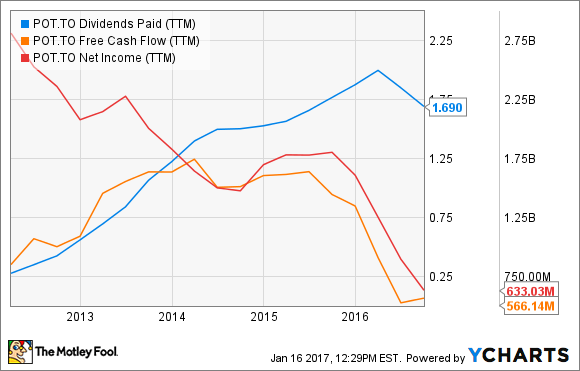 Will Potash Corporation of Saskatchewan Inc. Raise its Dividend in 2017? Income investors won’t forgive Potash Corporation of Saskatchewan Inc. (TSX:POT)(NYSE:POT) easily for 2016. The fertilizer giant slashed its dividend not once, but twice last year, shaking income investors’ faith in what was considered to be one of the most reliable dividend stocks around. From +6% dividend yields, Potash Corp. is now yielding only 2%. The question bothering income investors now is whether Potash Corp. will give them another shock this year or surprise with a dividend hike as business conditions improve. Let’s find out. Potash Corp.’s dividend cuts were steep; the first was 34% and the second a whopping 60%. The weak business environment wasn’t really to blame. (How did peers Agrium Inc. (TSX:AGU)(NYSE:AGU) and Mosaic Co (NYSE:MOS) maintain their dividends despite operating in a similar challenging environment?) The problem was in Potash Corp.’s aggressive dividend policy. Unlike Agrium or Mosaic, which maintained payout ratios blow 50%, Potash Corp. paid out its entire earnings in dividends in 2015. With the company hitting a 100% payout ratio at a time when the fertilizer markets were deteriorating, it was left with only two options: slash the dividend or burn cash and pay more than it earned. With earnings falling rapidly, Potash Corp. announced its first-ever dividend cut in history in January 2016. Sadly, management still didn’t foresee what was coming and intended to maintain a payout close to 100% for the year. In July, Potash Corp. had to announce yet another dividend cut along with a big downgrade of its earnings projection for the full year. So where does Potash Corp.’s payout ratio stand now? You wouldn’t want to know. Potash Corp. paid nearly US$1 billion in dividends against net income and free cash flow (FCF) worth only about US$478 million and US$458 million, respectively, during the trailing 12 months. It’s an ugly picture. That huge gap in dividends and FCF tells us that the company still has a long way to go to bring its dividends down to sustainable levels. This year, Potash Corp.’s earnings could improve as fertilizer prices stabilize and the company brings its lowest-cost mine at Rocanville online. Potash Corp.’s impending merger with Agrium, if completed, will also be beneficial as it should reduce Potash Corp.’s exposure to the volatile fertilizer markets. On the flip side, I don’t see potash prices recovering much, and I’m also apprehensive about demand from key consumers China and India. If both countries delay contracts like last year, Potash Corp.’s volumes and top line could come under pressure. Potash Corp. may not decrease its dividend again in 2017 as it finds support in Agrium’s cash flows after the merger, but I don’t see a hike coming either. After a dividend policy that went horribly wrong, Potash Corp. management will be more cautious than ever before announcing a dividend raise again. So forget Potash Corp. and check these three “Cash Kings” that have an average yield of 4.0%... are poised to profit from three diverse (and highly crucial) sectors of the economy… and look like they have the ability to grow their dividend well into the future. Fool contributor Neha Chamaria has no position in any stocks mentioned. Agrium is a recommendation of Stock Advisor Canada.